Before Obama Nomination, A Roll Call For Clinton Democratic delegates in Denver are preparing to nominate Barack Obama as their presidential candidate. But before that can happen, Hillary Clinton's name will be placed alongside Obama's in a roll call. Clinton has asked her candidates to back Obama. Democratic delegates in Denver are preparing to nominate Barack Obama as their presidential candidate. But before that can happen, Hillary Clinton's name will be placed alongside Obama's in a roll call. Clinton has asked her candidates to back Obama. In Denver, the nomination of Barack Obama gets underway in this hour. And a dramatic moment this afternoon in preparation for the roll call, Hillary Clinton met with her supporters. Senator HILLARY CLINTON (Democrat, New York): I am here today to release you as my delegates. SIEGEL: Clinton went on to tell her unhappy supporters that it's now up to them how they vote. Joining us now from the Pepsi Center in Denver is NPR's national political correspondent, Mara Liasson. Hi, Mara. SIEGEL: And, first of all, what have you been hearing from supporters of Hillary Clinton? LIASSON: Well, from supporters of Hillary Clinton, I've been hearing a lot of mixed feelings. Last night, they thought she was absolutely fabulous. For a lot of them, it just affirmed their feelings that she should have been the nominee or at least the vice presidential nominee. But that being said, I think most of them are getting to the stage where they are willing to do what she asks them to do, which is rally behind Barack Obama. Of course, there are going to be some diehard Hillary supporters who won't. But I do think that she accomplished a lot of what she said have to accomplish, which was to unify the party. I think the bigger problem for Barack Obama about this is you know, he has a nickname in the campaign, no drama Obama. LIASSON: He likes things kind of cool, disciplined. But the Clintons are the reverse of that. And there has been a lot of drama here, more than I think Obama would have wanted. And it has centered around the Clintons, both of them. SIEGEL: Now, first, what's actually going on in the convention hall right now, Mara? LIASSON: Well, what's actually going to go on now is Barack Obama is going to be formally nominated, so is Hillary Clinton. The states are going to turn in their tally sheets. We're going to have seven speeches, a nominating speech and two second (unintelligible) speeches for Hillary Clinton and then a nominating speech on three second (unintelligible) speech for Barack Obama. Then, there will be a roll call. The magic number is 2,210. However, it's very likely that at some point, before one of them reaches that, Obama obviously, maybe when we get to New York state, Hillary Clinton herself, who has plans to announce her own state's tabulation of delegates, will say we should stop the roll call and nominate Obama by acclamation. You heard her say in the clip you just played. She's releasing her delegates. She didn't tell them she wants them to vote for him, but she also didn't say she wants them to vote for her. She said they should do what they want. SIEGEL: But it does sound amazingly like a political convention, what you're describing right there. LIASSON: Isn't that incredible because we thought they were extinct. Right. SIEGEL: I know. Two speakers tonight, first, Joe Biden is going to speak. What do we expect to hear from him? LIASSON: Well, Joe Biden is going to introduce himself to the American people. He's not well known. We've seen in the polls that there haven't really been any bump at all from his addition to the ticket. He also is going to take the bark off John McCain, that is one of the prime responsibility of the vice presidential candidate. And I also think he's going to make a pitch for kind of older white middle class and working class families so that they can relate to the Democratic ticket and particularly to Barack Obama. He's been described by Obama as the scrappy kid from Scranton, Scranton, of course now, becoming the ground zero for those white working class voters that Obama has been trouble reaching. And I think he wants to lend a little bit of his own white Catholic middle class creed to Obama. And I think you're going to hear him do a kind of a more elaborate version of what he did in Springfield, Illinois when he was added to the ticket. SIEGEL: And the other big speaker tonight is Bill Clinton. LIASSON: …because the Obama campaign has not been able to vet his speech as they wanted to. But I do expect him to make the case for Obama in a very full throated and eloquent way that only he can. And I also think he's going to make the case for his own legacy at the same time. SIEGEL: Okay. Thank you, Mara. SIEGEL: NPR national political correspondent Mara Liasson at the Pepsi Center in Denver. 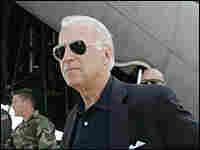 In August 2008, Biden traveled to the conflict zone in Tbilisi, Georgia. He met with U.S. soldiers on Aug. 17. Presumptive vice presidential candidate Joseph Biden will headline a Democratic convention evening Wednesday devoted largely to foreign policy and national security issues. Foreign policy expertise was one of the main reasons Barack Obama brought the Delaware senator to the ticket. The evening's speeches and events are designed to show how the two running mates and other party leaders will mesh in their approach to America's role in the world. But some question how closely the ideas of Biden and Obama align. The party platform for this convention contains a long list of areas where Democrats promise to take decisive action, from ending the war in Iraq to combating global climate change. Susan Rice, one of the Obama campaign's key advisers, says foreign policy occupies about a third of this document. Rice says the platform committee was about evenly divided between Obama supporters and those of Sen. Hillary Clinton, and she describes the result as a "completely noncontentious unity document." While the platform document was drafted before Obama announced that Joe Biden would be his running mate, Rice says the influence of Biden's ideas was strong. A principal author of the foreign policy section was Tony Blinken, Biden's Senate chief of staff, who volunteered to help with the platform after Biden dropped out of the presidential race last year. Republican observers don't necessarily buy the idea that the Democrats' foreign policy team is noncontentious. Robert Kagan, a principal foreign policy adviser to Republican candidate John McCain, says Rice herself represents one side in a foreign policy struggle inside the Obama camp, what he calls the "left-realist view" as opposed to the more "internationalist, democracy-promoting Clinton crowd." Kagan, a senior associate at the Carnegie Endowment for International Peace, sees Biden as being closer to the Clinton camp. Obama, Biden on the Same Page? Party platforms tend to be short on specifics, and that makes it hard to see whether there are gaps between the running mates' approaches to various issues. The foreign policy section of the Democratic platform begins with the best-known of Obama's foreign policy positions, his opposition to the Iraq war and insistence on a 16-month timetable for bringing U.S. combat troops home. It doesn't speak to a proposal that Biden launched in 2006, for decentralizing Iraq and giving Shiites, Sunnis and Kurds their own regions, supported by shares in the country's oil wealth. Biden, who used the plan as the centerpiece of his recent presidential bid, insisted it did not amount to partition but to substantial autonomy for the regions as a way of reducing ethnic and religious frictions. The platform calls for providing more resources for the war in Afghanistan, including two additional combat brigades, and seeking greater contributions from NATO allies. It also calls for a "new partnership" with Pakistan. "We will ask more of the Pakistani government, rather than offer a blank check to an undemocratic president," it says. Both countries are examples of how the two running mates have melded over the past couple of years. 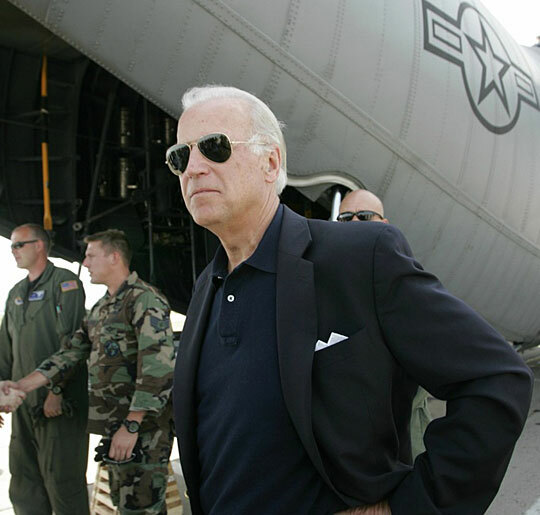 In fact, when Biden was running for president in August of last year, his campaign mocked Obama in a statement congratulating him for "arriving at a number of Sen. Biden's long-held views on combating al-Qaida in Afghanistan and Pakistan." The platform takes a slap at the Bush administration's unilateralism on foreign policy, promising to rebuild alliances and institutions that deal with common security. "Needed reform of these alliances and institutions will not come by bullying other countries to ratify American demands," it says. But in many ways, it seems to follow the pragmatic path of taking up where the Bush administration leaves off. The platform reaffirms U.S. commitments to Israel and condemnation of Hamas. Rice says that Democrats are not looking to reinvent the wheel when it comes to peace negotiations between Israel and the Palestinians. "We want to assure the parties that their efforts up until now won't have been in vain," she says. In many ways, Wednesday night's program will be aimed at assuring voters that the Obama-Biden ticket has a firm grip on foreign policy. Leslie Gelb, who co-wrote the Iraq division plan with Biden, says Obama's foreign policy views still aren't widely known. Gelb, who is president emeritus of the Council on Foreign Relations, jokes that Biden "has 300 years of foreign policy experience." Gelb sees Biden as a "pragmatic centrist" and says he'll judge Biden's speech on whether its proposals are practical and achievable. He cites the Georgia-South Ossetia-Russia conflict as an example: "Practical and achievable is helping Georgia to reconstruct itself and getting it to focus on that reconstruction rather than tweaking Moscow's nose." Derek Chollet, who was a foreign policy adviser to John Edwards' presidential campaign, says he's looking for more than that. Chollet, who also worked on the Democratic platform, says "foreign policy issues traditionally don't get that much attention at a convention." The fact that Democrats are highlighting these issues, he says, "shows this is a fight they want. I see Obama's pick of Biden as not showing that Obama is weak on these issues. I think it's a sign that Democrats think they're on the winning side of these issues. It's a display of confidence, and that's a big change."